I hope you all had a great weekend! After a few days of recovering, I finally got out of the house this weekend and it felt so great to be back to normal! I wore this look to brunch yesterday with some of our friends and it was perfect for the weather and occasion. This shirt is so so great for layering! It looks like a utility jacket, but so light weight which makes it perfect for Spring + Summer. It was around 87 degrees here yesterday, so I definitely didn't need much to layer with. And can we talk about this bag?! I love, love, love a vintage, designer piece that is in great condition and this one so chic! It also has a strap with it, so I plan to carry it a lot as a crossbody bag. This one is the Alma 'MM', but The Lady Bag has so many options for gently used, vintage pieces that you'll love. Use code MEGAN50 for $50 OFF your purchase + free shipping!! After almost a year of redecorating, I'm SO excited to finally share our HOME TOUR on SMP Living today!! I'm also taking over their instagram to share some of my favorite rooms in our home, so be sure to follow along! Also, I'll be sharing the photos of each and every detail right here on For All Things Lovely later this week! P.S. - My content is going to look a little bit different this week, so I just wanted to give you guys a heads up! Obviously I'm SO excited to finally share my Home Tour with you guys, but because of the surgical bra I have to wear for one week while recovering, it makes outfit posts pretty difficult. Let's just say, it doesn't go so well with a sundress. :) So, between the Home Tour reveal and some other great content I have coming your way, bare with me as this week is a little off! You guys are the best and I appreciate your kind words and encouragement more than you know! xoxo. This is the perfect, casual spring look! 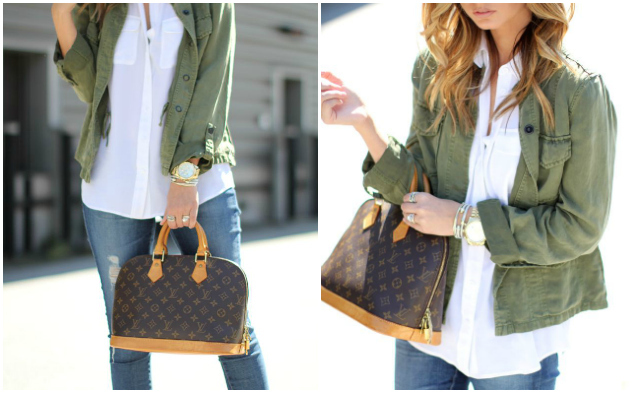 I love that utility jacket! Loving this outfit! This is totally my style, and I love those heels you've paired with it! You look great! Love that bag with this outfit! Great outfit! So simple, yet so cute! Can't wait to see your house tour pictures! So happy you were able to get out and enjoy the weekend! Excited for the home tour!!! Wishing you all the best! Glad you could enjoy the weekend! Such a gorgeous look - loving your chic jacket. You've styled it beautifully! Thinking of you pretty lady and hope you feel better soon!! I'm so glad to hear you're recovering well! I wish you the very best of luck with it! On the plus side, this outfit is FAB! 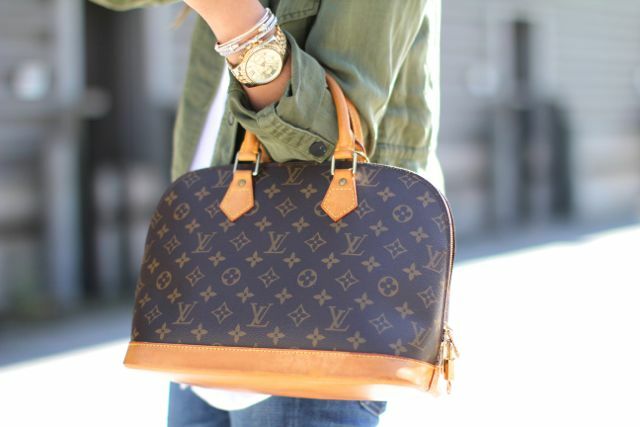 I love the classic LV & the utility jacket - so gorgeous with simple, pared back pieces. I have been praying for you all week Megan! I'm so happy to hear you were able to get out over the weekend. I absolutely loved your home tour! It was a dream! I love everything about this look!! Awesome! !